“Up until now, all boardgames have been primarily meant for people without a physical disability, which meant that a large and important target group was left out of the boardgame market. We felt that this is our opportunity to change something,“ says Oskar Mihhailov about his business idea Boardgame ALU chosen among Ajujaht`s TOP 30. The co-author of the idea, Kermo Aruoja, adds that though the idea was born from a specific need and concern, the game is exciting for everyone. Boardgame ALU is a resource-based strategy game for two players. The aim of the game is to control a bigger area than the opponent. The players use game pieces to occupy an area and perform different activities by using the resources available. “The game develops strategic thinkingand planning skills,“ says Oscar, the author of the idea. 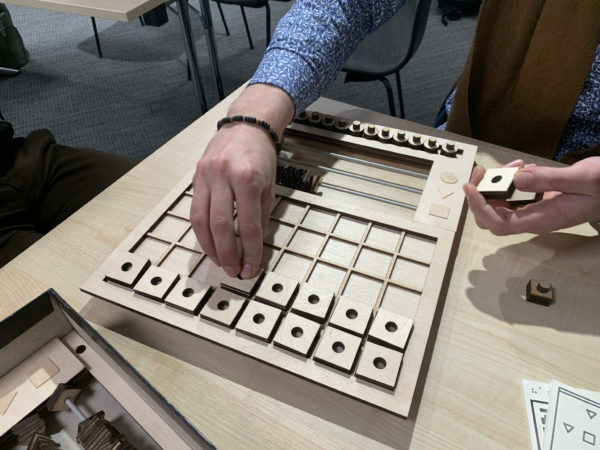 ALU boardgame is made of wood and is fully tactile, so it can be played by people with severe visual impairment or motoric disabilities. If the game were to be categorised, then it would be an abstract strategy game. “Same category as chess and checkers,“ explains Oskar. The more market research they did, the more they realised that there is only one boardgame meant for people with visual impairment. “It is surprising that we came up with something so innovative,“ says Kermo. The idea started from an engaging Estonian Academy of Art design course. “The course included a workshop, where a blind trainer asked us to do the entire 3-4-hour seminar blindfolded. We got to feel and experience different problems that people with a visual impairment experience on a daily basis.“ The trainer shared his story, saying he`d like to play boardgames with his grandchildren, but hasn`t found it easy. “Someone always has to explain what the boardgame looks like or what is happening on the board,“ explains Oskar. During the same subject course, they were tasked with coming up with a design or solution which would help those with special needs. Oskar had an idea for a boardgame and Kermo happened to be on the team. “We were sitting next to each other in class and ideas were being pitched. The teacher asked Oskar what he is doing and Oskar said he`d like to create a boardgame. As I was sitting next to Oskar, then the instructor asked in an affirmative manner whether I am doing it with him. I said, I guess so,“ says Kermo about forming the team. For the first six months, Oskar and Kermo worked on the game`s problem design and rules` development. For the next six months, they focused on creating the first prototype. Though, both specialised in graphic design at the Estonian Academy of Art, games have always been close to both of their hearts. “Oskar likes boardgames, I like computer games,“ says Kermo. Creating ALU has combined both guys` interest in games and design. The most interesting and challenging part of creating the game has been figuring out the central focus and how to reach a solution in the most efficient way. It has also been important how the game works for people with a visual impairment, what are the obstacles for them and how to solve them. At the moment, preparations for production are on the way. According to Oskar, the hardest part has been finding suitable production partners, because there are a lot of different details. “Trying to keep the price as low as possible, making sure it is pleasing to the eye and touch is quite a tough challenge,“ says Oskar. Kermo adds that the design process for the game`s set of problems was also complicated. The team plans to initially enter the market through different associations and societies. “At the moment, we have good contact with the Estonian Blind Union, which has shown interest in purchasing the games when they come out of production,“ says Kermo. 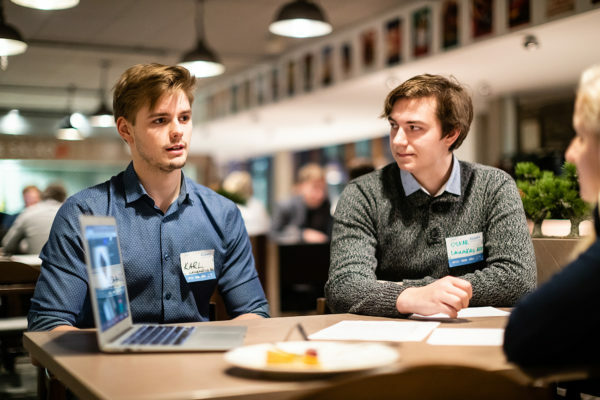 Next, the young men want to bring the game to retail chains, after which they plan on entering the Nordics and other European countries. Speaking of the feedback to the game, then both say it has been positive. Maybe even too positive, because both believe criticism helps them improve the game and find mistakes. Oskar says that the game has been played by friends, family and coursemates at school. “With coursemates, we gave them the game to play as we stood by and didn`t give any explanations on how to play it. We wanted to see, whether the game set is enough for people to figure it out on their own. It turns out, it is,“ he adds. They have tested the game at Brain Games evenings in Tallinn. The name of the game also stands out. Kermo says there`s an interesting backstory as well. ALU game is a grid, where the players have ended up and their goal is to find a way out.“Already at school, we were taught that things should have a story and an integral concept. And in the game, we have thought through every last detail,“ add Kermo. The game will hopefully be available in autumn. The ALU team will start direct sales earlier after the first gameboards are finished.